I have quite a busy morning. The storm is raging outside and it might take longer than usual to get to to the office, no time for cooking. For breakfast, I fixed two bowls, using the oatmeal, I cooked over the weekend. I see some dark yellow grains in your oatmeal. Did you add some wheatberries? Also, what kind of oats do you use? No, wheatberries, Marulka. 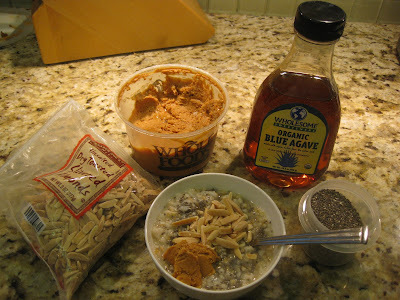 I used steel cut oats, from Bob's Red Mills. Bought them at Costco. Looks great! 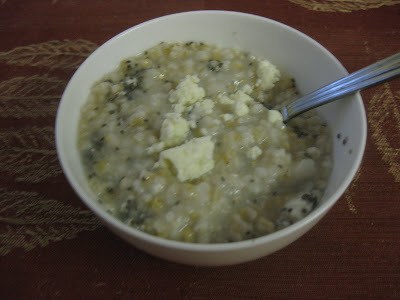 I do a very similar thing to you and Marulka, but I use raw rolled oatmeal. 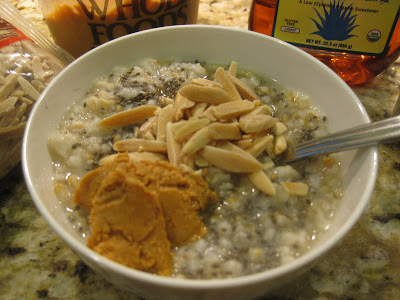 I but the oats bulk at WF together with various nuts and some dryed fruits (mangoes work especially well). I have some baked whole coco beans (bought at a coco plant in Costa Rica, but you can also find them in CO-op stores... what a wonderful way to remember my trip :). I also add crushed maccademian nuts and coconut shreads. All of this goes in to a bowl with some milk and 1/2 tea spoon of honey (optional). I usually make it right when I wake up... as I have all ingreadients already premixed... and let it soak for about 20 min, while I am getting ready. If I have time I sometimes shread and apple and add it to the oatmeal, or cut a banana or strawberries, etc. I enjoy it with my morning coffee. It is much more coarse than the coocked version, but I really like it that way. I will post the full recipe with pics some of these days. That would be great - do you use warm/ hot milk?